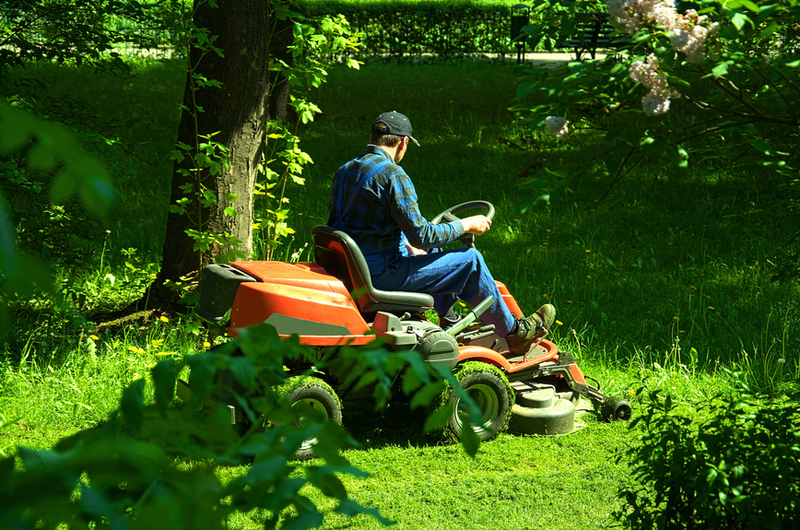 If you have a busy day planned and want to start mowing early, it’s important that you know your State’s noise restriction times – because the last thing you need on a $50 mowing job, is an abusive neighbour or a $1000* on-the-spot Council noise fine. Noise can be defined “unwanted sound” – an objectionable measurement that can differ from person to person. What can be unbearable for one person may pass almost unnoticed by another. How annoyed we become depends on the loudness, time, place and frequency of the noise. Natural sounds in the environment are typically more tolerable than those made by humans, pets and power tool machinery. 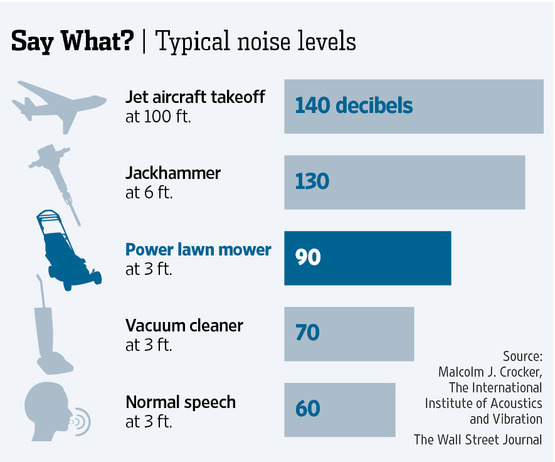 How noisy is a lawn mower? Different lawn mowers emit different levels of noise. Monash University found that the average lawn mower emits 87-94 decibels of noise. How does this compare to other noises? Can lawn mower noise be relaxing? Apparently, yes! There are actually videos on YouTube that have been created as ‘lawn mower noise relaxation’ videos. This one has had 26,000 views! What are the noise restriction rules? Disclaimer: This article is intended as a helpful guide to the basics. It is recommended that you contact your relevant local council for confirmation of times and fine amounts. * The $1000 fine example was from the Gympie Regional Council in Queensland. For non-building complaints in residential areas, most local councils will issue a Direction Notice asking you to desist making noise outside of the permitted times. If you do not comply, you may receive an on-the-spot fine, or in severe cases be threatened with prosecution. Fine amounts vary across Australia, typically from $200 – $1000. Which far exceeds what you might have made if it was a cheap lawn mowing job. So, unless you fancy abusive neighbours or council fines, it’s best to stick to the rules. It will make your life easier and it will make your customer’s life easier. The World’s Quietest Power Mower? Here is the 2014 Briggs & Stratten lawnmower with the QPT™ push mower engine that claims to be the world’s quietest mower. See what you think? SA needs to get with the rest of the country with lawn mowing all at 7am except SA !!!!!!! Hi Jan! Thanks for joining in the conversation. What time do you usually prefer mow lawns over in SA? Your joking right 8 o clock is when my children wake up but no i have to put up with there bad moods because of neighbours consistantly waking them up we need to hurry up and make it 8. I’m with you James. As per my comment below, party goers are usually way more disruptive than a 30-60min mower. What’s your point here? Both are loud and doing one or the other at obscene hours is careless. Mowers should not be allowed until 10:00 am on Sundays, like in TAS! Some people enjoy the peaceful Sunday morning in bed with a lover. I have a neighbor who mows every Sunday morning. I’d blow up at him if it wasn’t such an obvious sign he was trying to drown out the low hum of his miserable marriage. Normal mowing is not actually that much of an issue but it is the associated tasks that go hand in hand with the overall job. on weekends 7.30 to 6.00pm I like to listen to the news at 6 pm and have people mowing and wiper sniping and blower up to 7.30 on a hot day don’t want to lock up the house to stop noise. Someone who wants to mow lawns at 7am is crazy! Have respect for the shift workers! Only lawn mowing businesses would want to start mowing lawns at 7am! What other businesses mow lawns except for lawn mowing businesses?? I suppose it doesnt matter if we dont have enough hours in the only day we have off to do our chores and hopefully get a little rest before back into another hetic week. How dare we be so inconsiderate. Im sure there is someone at home and im sure if your working 6 days a week you coupd afford someone to come do it for you. Sorry but I work 6 days a week. I would like to have one day yo slee late and not be woken up to an early laen mower. Thats inconsiderate. Well Glenn you sound a like a bit of a selfish fuc*wit don’t you? MOST people like to sleep past 7am and 8am on a Sunday, but because YOU like to do it early everyone else should suffer your noise? People like you are the problem with society. I wish the worst. Having been a shift worker for many years, I have come to accept unwanted noise as part of the territory. You can’t stop the world from functioning just because you decide to work the graveyard shift. That’s where headphones/earplugs came in handy for me. Besides that, anyone who has a regular 9-5 job should be used to getting up around 7am anyway. In my opinion 7 is quite acceptable for anyone wanting to mow a lawn (business or not) on any day except a Sunday morning. Oh, and for party’s not being as disruptive as a lawn mower – you have got to be kidding! Mowing a lawn usually takes about 1hr tops. Most people continue a party for 4+ hours and the disruptive ones go on into the early hours of the morning. Loud music, people yelling and carrying on, and cars coming and going is far more annoying than the continuous hum of a mower. But I guess it’s may be based on YOUR lifestyle. If you are one of those loud-party type of people, you are probably oblivious to how much that upsets your neighbours. I live on an acreage on a rural residential property (6 acres). I am also retired now and in my mid sixties. With Queensland’s super hot climate in summer I would like to start mowing earlier than 7am (and remember 7am in Queensland is really 8am in the rest of the Eastern states in Summer). It is crazy for senior citizens to be out in the hottest part of the day mowing. And a question: Is the law different for people in rural residential areas where houses are widely separated? Farmers near me regularly are out on their tractors very early and it doesn’t bother me. If ur not already up by 7am ur a lazy bugga except if ur on shift WK. Why sleep ur life away…get up get active. Good on the noise. Birds r awake. U should b awake. Parties that go for too long r inconsiderate. That’s why they invented night clubs. Hi Peter, not sure what the rules are in Texas. The times we put on our site are a guide for Australia only. Cheers. Texas is a town in rural QLD Andrea. i think in south australiait should be 7am as that way you can get it done in the collest partof the day. then you have the rest of the dayto doyour shopping etc and also rest. i haveonce startede at 8;30 am just to fit three in in one day. how everr my neighbors just after theybrought the house were using their chainsaw at about 6am every day. we went away omn a holiday and when we came back they had no chainsaw. #suckedinstuipdidiots. i later found out that someone rang the cops andthe chainsaw was taken away and sold off due to them not caring. the person whom called the cops had asked themto not do it so early and that was ignored twiceso cops got invloved. myneighb0ors dont mind if i startearly as they knowim a busy chap usally juggling four to five once a month on the same weekend. as well as swimming.i may be tired but it makes me sleep well.